So each November for the last several years my awesome hubby and I have made the trek out to Nevada for an auto convention. Since we had never been to the desert, on that first trip we incorporated a day trip out to the Valley of Fire and Hoover Dam. To this day I am still in awe of the raw beauty and incredible scenery that is around every bend. Our annual trip has included visits to, Death Valley, Grand Canyon, Bryce Canyon, Zion National Park, Sedona, Albuquerque, and more! Plus a cross country drive all the way back to Georgia! I can't wait for our trip this year. For my lollipops I used I used Lorann's recipe. 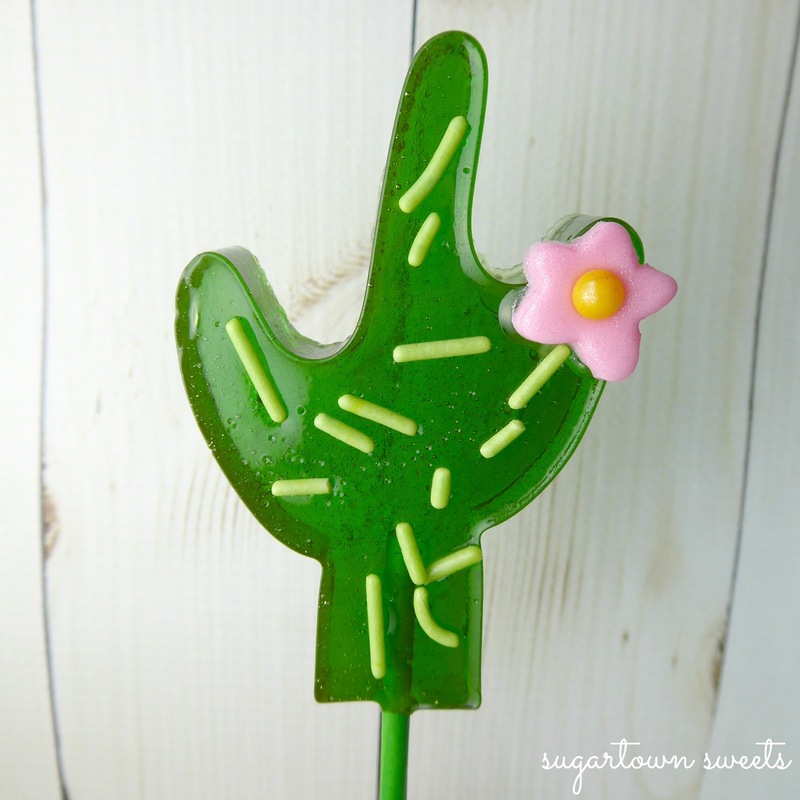 Sugar, light corn syrup, water, color, and flavoring are all you need to turn out these cute little cactus lollies! 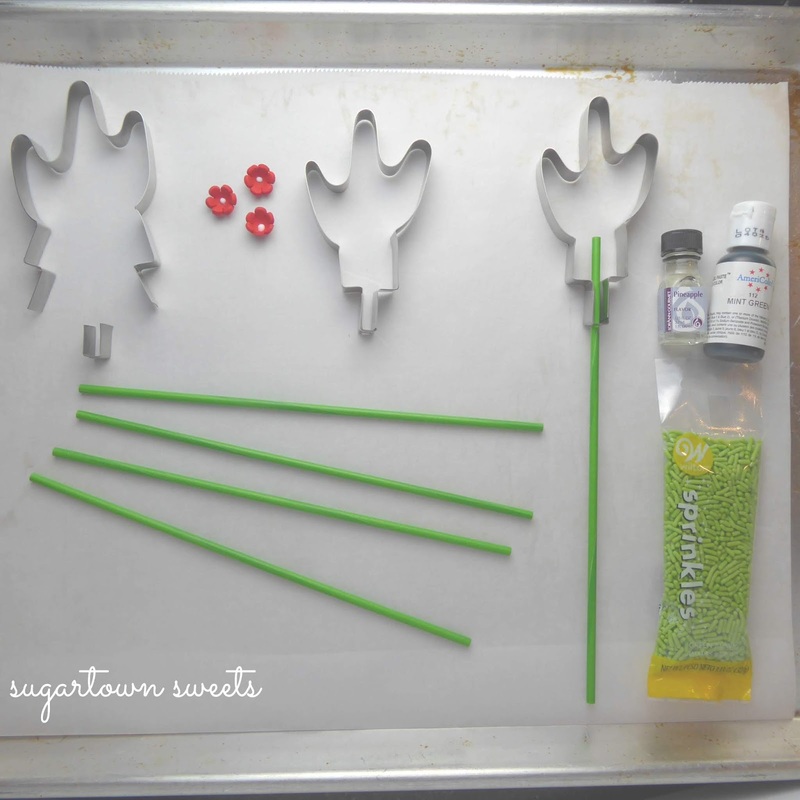 Well, you do also need lollipop molds, ready-made sugar flowers, (or make your own fondant ones like i did), green jimmie sprinkles, lollipop sticks, non-stick spray, parchment paper, and a candy thermometer! 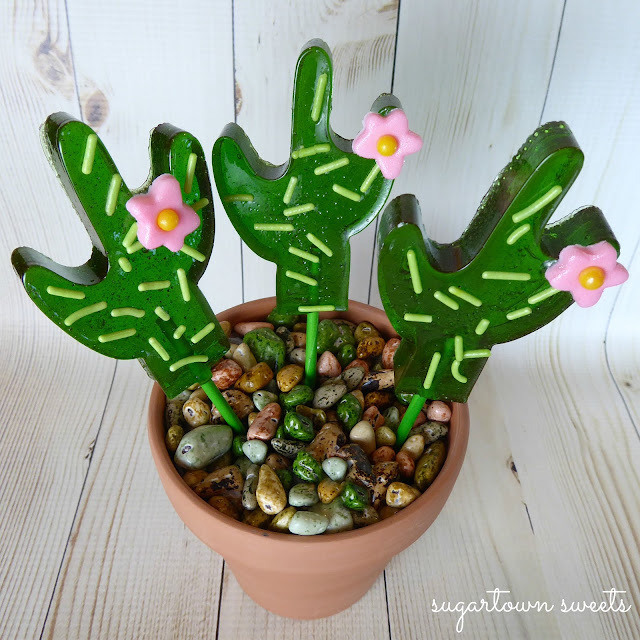 I found these cactus lollipop molds online! 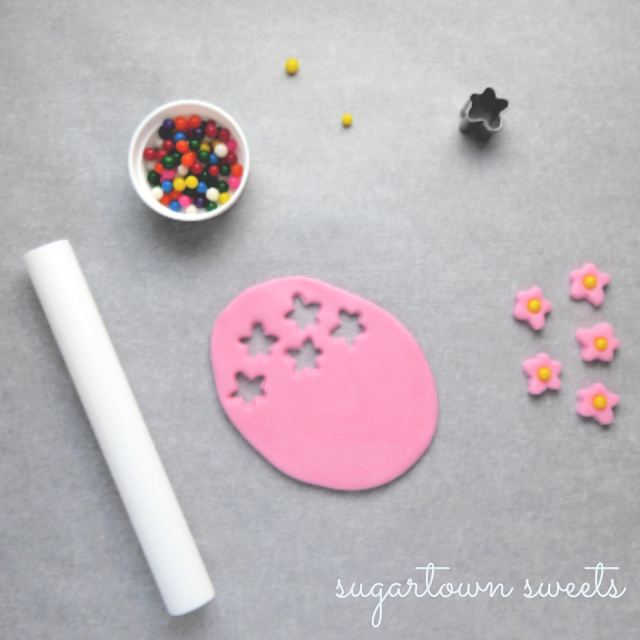 I was going to use ready-made sugar flowers but wasn't happy with the way they looked so I used pink fondant, a tiny flower cutter, and jumbo candy sprinkles for the centers to make my own. Aaand..yikes-Sorry about the blurry photo! 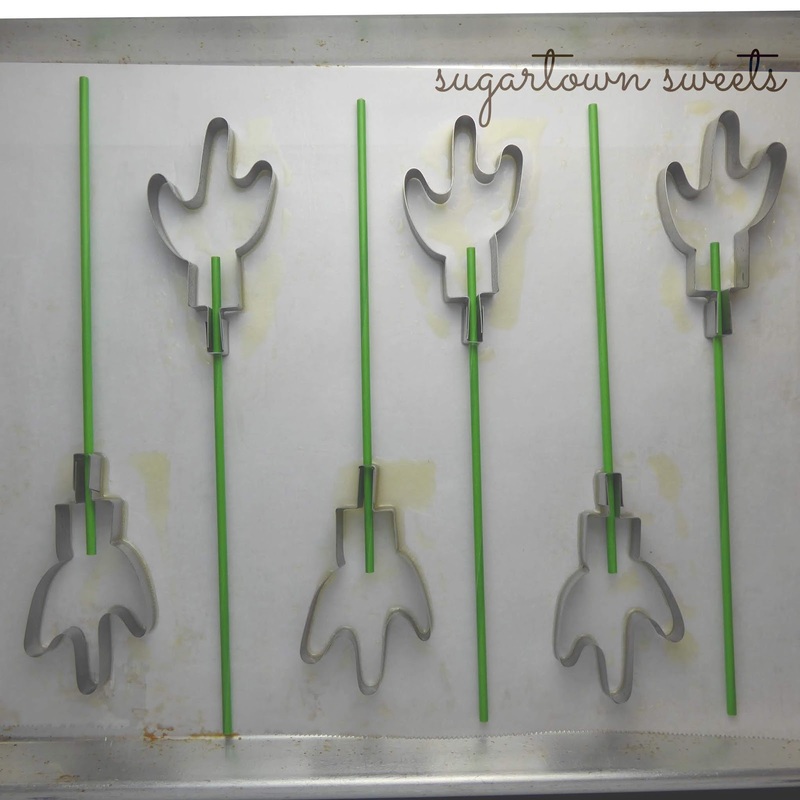 To begin, cover a sheet pan with parchment paper, attach clips to lollipop molds, spray molds with non-stick spray, and insert lollipop sticks into molds. For maximum use of space I alternated the placement of molds. Okay, so when I saw the gap between my mold and my pan, I kinda freaked out a little. Don't freak out. Keep scrolling. We'll go ahead and get started on our candy first. I always use my heavy-bottomed 4 quart pot and my candy thermometer for every batch of candy I make. Add sugar, corn syrup, and water to saucepan and stir over medium heat till sugar is dissolved. Crank up the heat to medium high and continue cooking without stirring. Add coloring at 260 degrees fahrenheit without stirring. 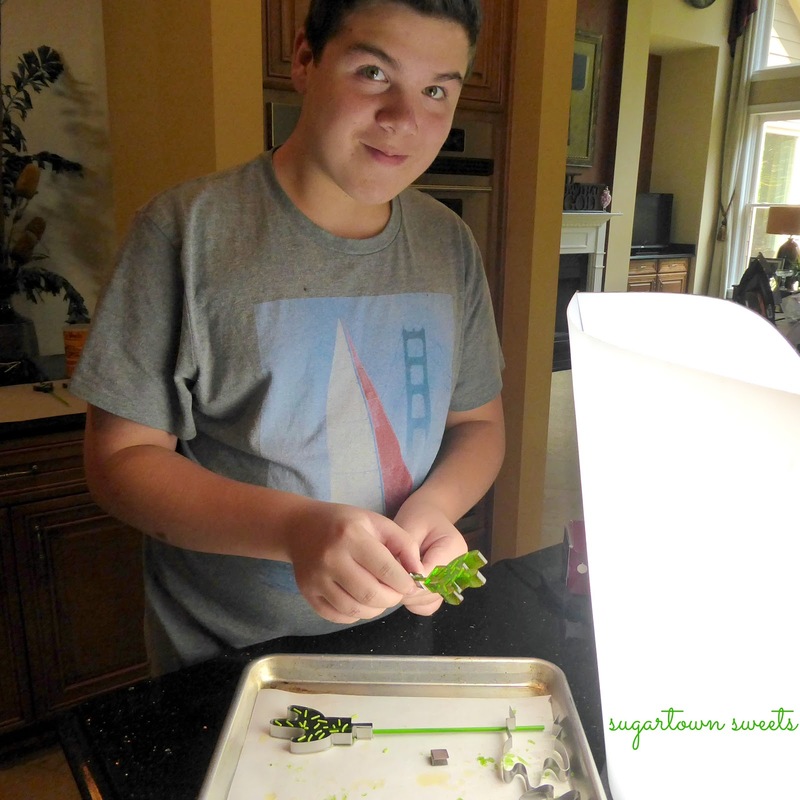 Continue cooking until candy reaches 300 degrees fahrenheit and remove from heat. When sugar mixture has stopped boiling, add coloring and stir. To get this deep dark green I used 3 drops of mint green soft gel paste. One thing I didn't mention earlier is that I heated my glass measuring cup in my 250 degree oven while made my candy. I think this helped keep the candy mixture hot enough while I poured and decorated my lollipops..Although I still needed to work quickly! It can get pretty difficult trying to take photos of each process while working with heavy pans and hot candy. 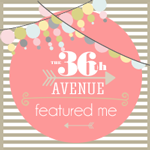 Every photo i have posted on my blog has been shot by yours truly..until today! 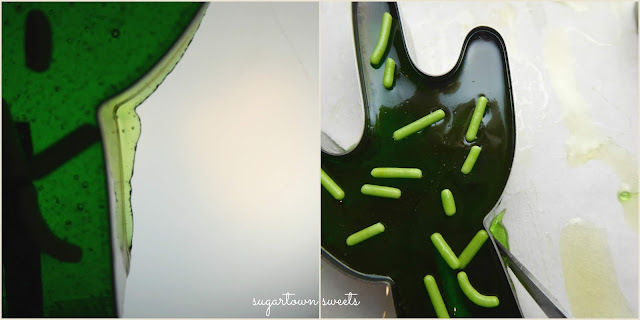 Okay, continuing below you can see where the candy seeped out from under the mold. No problem! After sprinkling on the green jimmies..
And after the lollipops had set, I used a sharp knife to cut away any excess while the molds were still attached to the lollipops. It works if there is a little or a lot. Super easy! Here is a photo of my awesome helper today! The molds pop off effortlessly as you remove the clips. I think we were both surprised by just how easy they came off! With just a little dab of corn syrup, I attached the pink flowers. I used pineapple flavoring and we really loved it! We had enough candy mixture to easily make a dozen pops, but we made six and then played around with the remainder! *Please note that our Cinnamon, Clove and Peppermint flavors are particularly potent. You may wish to reduce the amount used for these flavors. Have all ingredients and tools assembled and within easy reach of the stove. The use of metal spoons and measuring utensils is recommended. Line a cookie sheet/jelly roll pan with foil and lightly oil or spray with non-stick cooking spray (such as PAM). If using molds, lightly spray cavities of clean, dry candy molds with non-stick cooking spray. Insert sucker sticks. 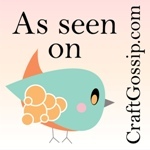 If using molds, you may also want to spray a piece of aluminum foil with cooking spray. 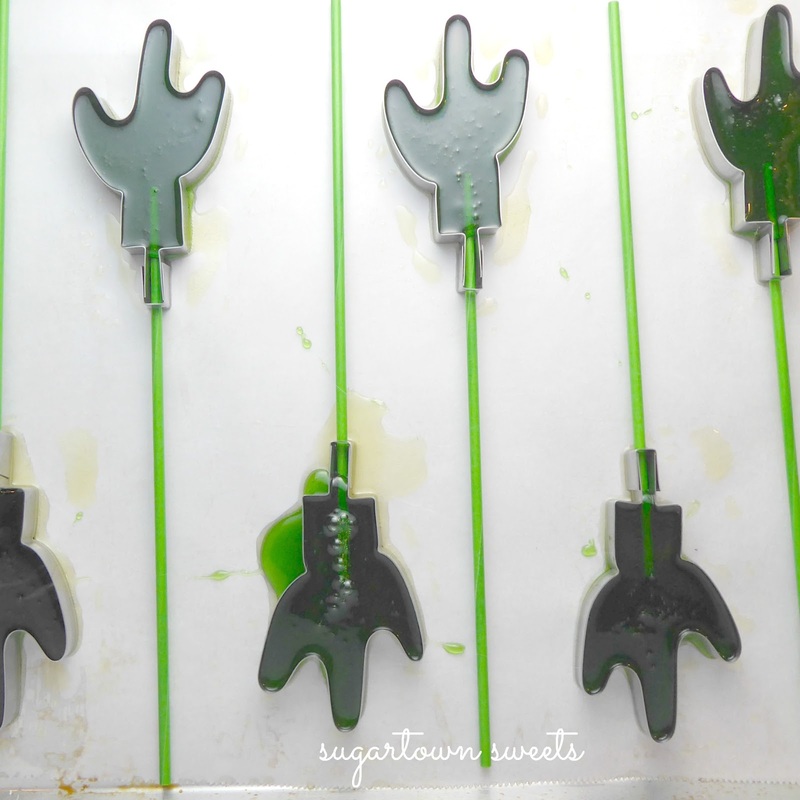 If after pouring the syrup into the molds you have excess candy, you can pour it onto the foil for break-up candy. In a heavy (good quality) 2-quart saucepan, mix together sugar, corn syrup and water. Stir over medium heat until sugar dissolves. 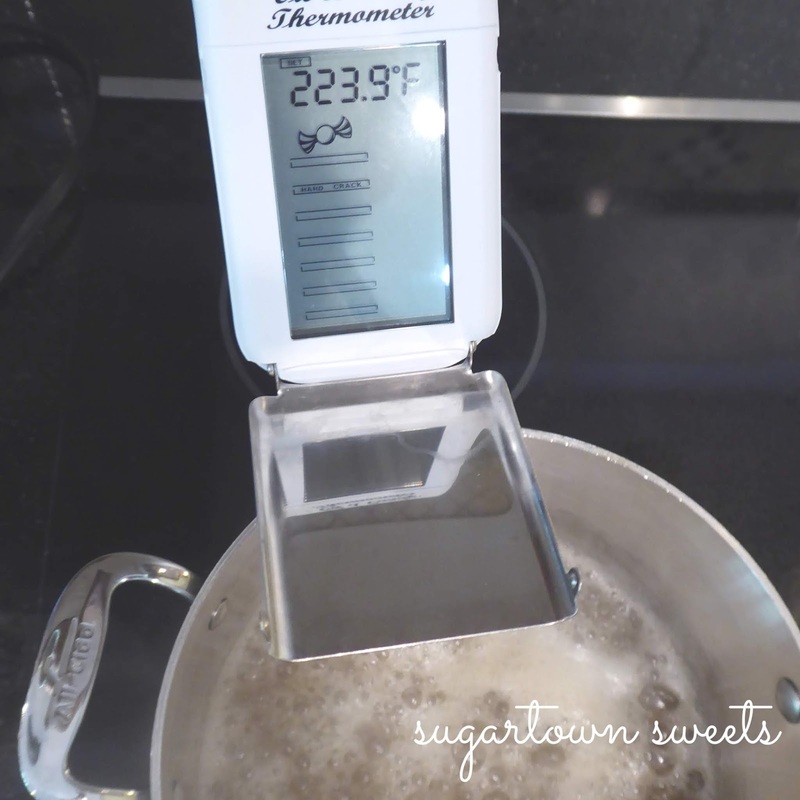 Insert candy thermometer if using, making certain it does not touch the bottom of the pan. Bring mixture to a boil without stirring. 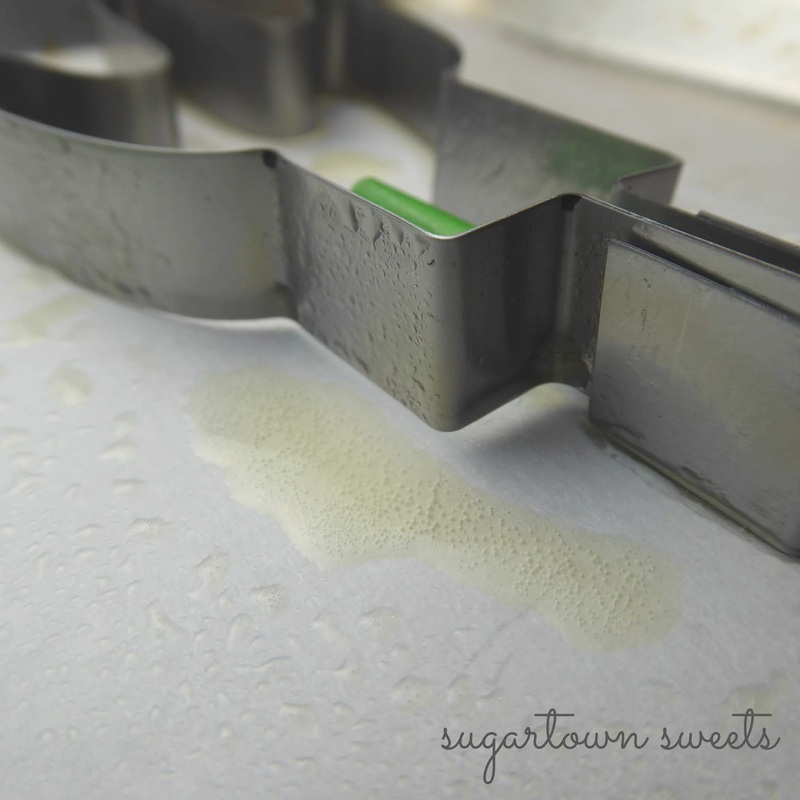 Early in the cooking process, "wash down" any sugar crystals that form on the sides of the pan with a wet pastry brush. Continue to cook the syrup, without stirring, until the temperature reaches 260º F; add drops of coloring until desired hue is achieved. Do not stir; boiling action will incorporate color into syrup. Remove from heat precisely at 300° F (temperature will continue rising), or until drops of syrup form hard, brittle threads in cold water (hard crack stage). After boiling action has ceased, add flavor and stir. USE CAUTION WHEN ADDING FLAVORING TO AVOID RISING STEAM. 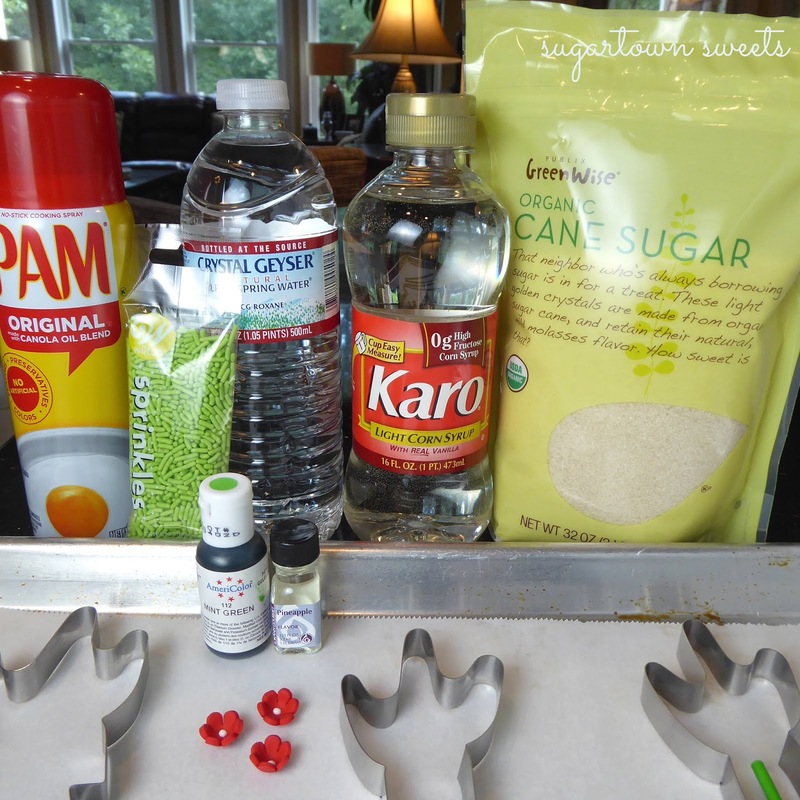 Carefully pour syrup into prepared molds or onto the prepared greased and foil lined cookie sheet. (As the sugar mixture begins to set up, you may want to score with a large knife to mark squares.) Do not refrigerate. Cool completely. Break sheet candy into small pieces and dust with powdered sugar, if desired. Store in airtight containers between waxed paper. 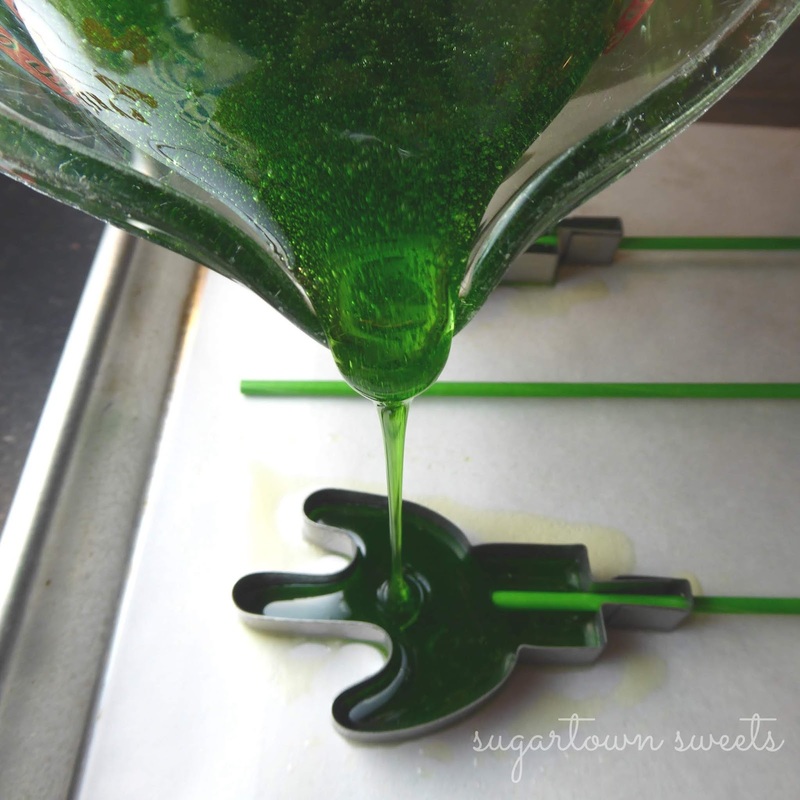 If making lollipops, do not dust with powdered sugar, but place in sucker bags and secure with twist ties. Store hard candy in a cool, dry place. Do not refrigerate. 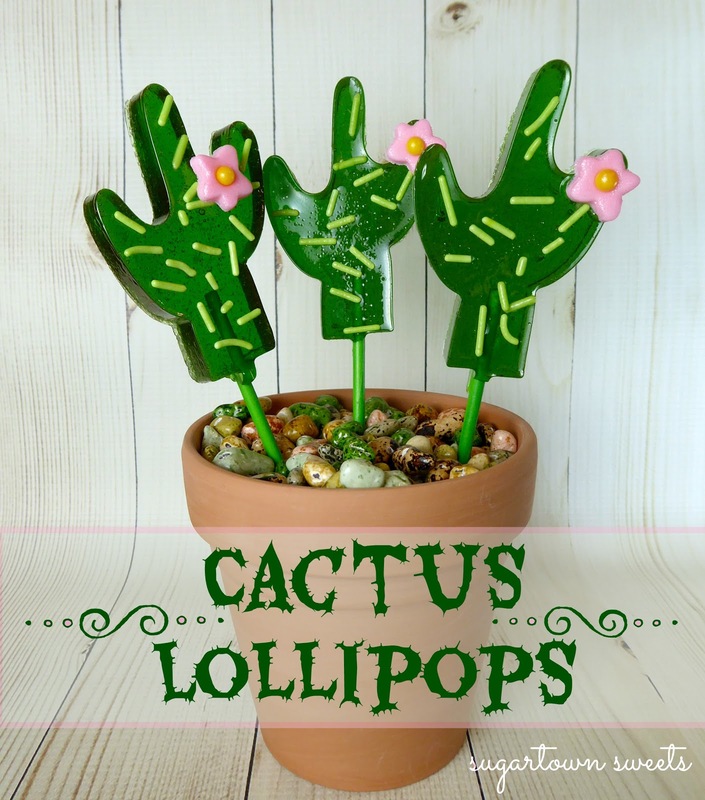 Love those candy molds and your lollipops look perfect. Where did you find your molds?